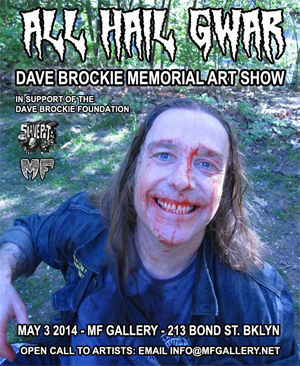 On Saturday May 3rd, MF Gallery is having a special memorial art show dedicated to our good friend Dave Brockie, a.k.a. Oderus Urungus of the band GWAR, who passed away suddenly in March 2014. Part of the proceeds from the show will benefit the Dave Brockie Foundation. Dave was prolific in many different visual mediums and he collaborated often with MF Gallery; from his solo show / performance in 2004 to GWAR's Crack-a-Thon in 2010 and 2011 and numerous group shows throughout the years. Nearly 100 artists have already responded to the open call for pieces that pay tribute to this legendary artist. Among them are: Lawrence Van Abbena, George Abruzzese, Tyghe Achenbach, Michael Alan, James Alexander, John Stuart Berger, Meg Bert, Chris Besaw, Cory Brown, Ben Busk, Fernando Carpaneda, Ryan Case, Karl Dahmer, Jason D'Aquino, Jennifer Daugherty, Shannon Daugherty, Angie Decay, Patrick Dignon, Extremo The Clown, Kate Ferry, PH Fred, Bob Gorman, Jorge A. Gwooki, Jenny Harada, Mark Harada, Curt Harbits, Annie Hunter, Eric Indin, Daniel Johnsson, Adam Lawton, Matt Maguire, Drew Maillard, Nick Ray McCann, Jessie McClenny, PJ McQuade, Scott Minzy, Geoff Mosher, Joe Murdach, Chris O'Neal, Bianca Panzram, Kembra Pfahler, Our Lady Of Perpetual PMS, Casey Orr, Sara Ray, Max Reinhart, Mark Riddick, Peter Rodriguez, Chris Roth, Lou Rusconi, John Russo, Frank Russo, Martina Secondo Russo, Rowan Sanders, Dan Scheckler, Joe Simko, Keri Sheheen, Dan Sites, Chantal Smith, Ryan Spahr, London Splatterer, Daniel Stoddard, Ben Streete, Tyson Summers, Sean Taylor, Aaron Tompkins, Camargo Valentino, Glenn Wernig, Michele Witchipoo, Dan Wolf Mask, Malice N. Wonderland, Jonathan Zeh, Sergio Zuniga & more! Artists, fans and friends of GWAR are invited to come see the art show and celebrate this great man's life with MF Gallery at the Opening Party, on Saturday May 3rd from 7 to 10pm. Music by GWAR, DEATH PIGGY and DBX will be playing all night, and there will be projections of various GWAR/Dave Brockie videos. Admission is free and open to all ages. MF Gallery is located at 213 Bond St. in Brooklyn, NY. Take the F or G train to Bergen St. The A or C to Hoyt/Schermehorn, or the R to Union.